Updated update :) Now each kanji has word associated with it. Update: fixed minor issues, improved performance and added more kanji. You can now edit and delete kanji. Please read the instructions. Have you ever wanted to learn to read and write Japanese, but couldn't understand the difficult writing system? This application will demystify the kanji by showing you their ingredients - radicals. 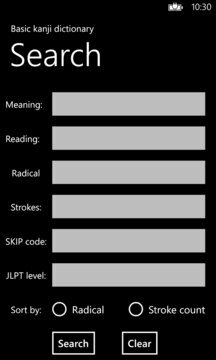 You can search for a character using reading, meaning or radical, test your knowledge and keep track of your progress, marking kanji as learned. 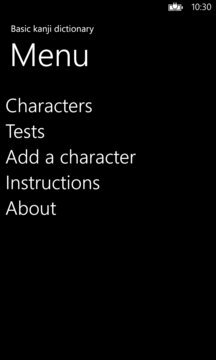 It contains basic characters only, but you can add new if you want.